Jamie Marshal was the 2014 Jerry Seiner Leadership Award winner. The following was written by his coach to nominate him for that award and demonstrates the difference one student can make to his/her team and community. Jamie participated on the Moab Red Devils team from 2012-2014. "Even though Jamie Marshall is only 17years old (his 17th birthday is the day before the St George race this year), he has demonstrated incredible leadership and maturity above and beyond the normal high school student. I have been lucky enough to observe this for many years now. As the youngest in his Senior class, Jamie leads by example and is well-respected by his peers, teammates and members in the community. Jamie has proven to be a great role for youngsters in Moab. He has been a volunteer for an after-school program that works with at-risk elementary students. He has taken the time to work with these kids at a high ropes challenge course, helping them build their confidence and believe in themselves. He has also volunteered with an elementary after-school mt bike program, leading trail rides and teaching 5th and 6th graders how to take care of their bikes. Jamie is an incredible teacher. He takes the time to logically explain things to people of all ages; I have watched him patiently instruct adults during an introductory welding class. Jamie also takes on additional responsibility without being asked. As a participant on the high school's Science Olympiad team, he took it upon himself to pick up the slack when a student dropped off the team the day before the state competition. He knew it was important for the team to be competitive in all the events they entered and he did not want the team to lose out on points. While juggling all of his activities and part-time jobs, Jamie maintains outstanding grades, has made honor roll each and every trimester since entering high school, and is a member of the National Honor Society. After high school, he aspires to be an engineer. He already has incredible fabrication skills -- Jamie has milled a derailleur hanger for his downhill bike, designed and welded a custom 4-bike rack and is the process of building his own Rat Rod. How many 17 year olds have done that? 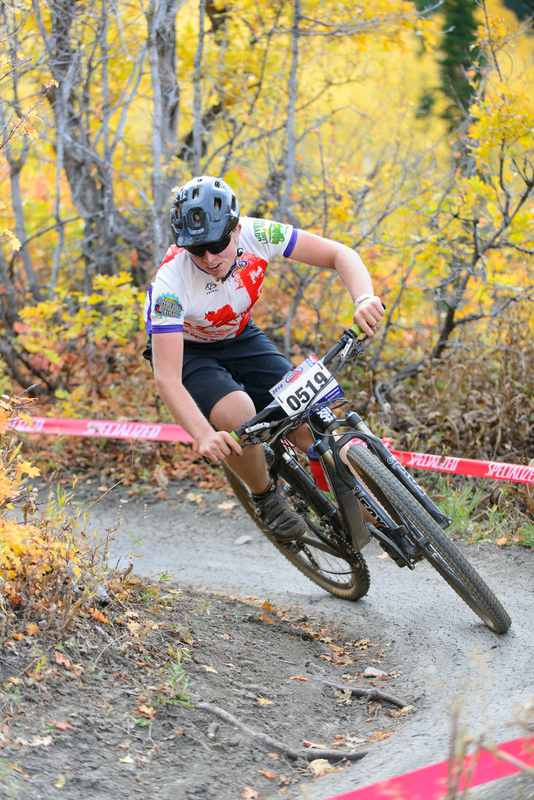 Now, let’s get to mountain biking: this is Jamie’s third year on the Moab Red Devil team. As the most seasoned member of the team, all the other riders look up to him. We do not have a designated team captain, yet Jamie naturally takes on the role of team leader. There are several riders who are not only new to the team, but are new to trail riding, and Jamie has taken them under his wing. He encourages them to be the best they can be; he will reverse his tracks and ride with them when they are off the back, and he patiently gives them riding tips when he sees that they are struggling. It makes no difference to him if they are one of the younger boys or one of the girls. Jamie is an optimist and finds the good in almost any situation he or his teammates are faced with. He knows how to make lemonade out of lemons. In regards to his racing accomplishments, Jamie had consistent finishes throughout the 2013 season. He was a top ten finisher in four of his five races, thus enabling him to finish 5th overall as a Division 2 Junior Varsity competitor. Jamie is not a natural athlete so he had to work hard for his medals. His devotion to reach his goals, combined with the sheer enjoyment he gets from riding and his other positive traits, makes him a well-rounded and well-respected member of his team, school and community. 2014 has been another story in the Varsity category. Jamie has been finishing near the end of the pack, but he always gives his best effort and continues to enjoy riding and racing. He hasn’t let the competition of the varsity category detract from the joy he continues to get from riding his bike, nor his attitude at practices and races. Thank you for taking the time to consider Jamie for this award."